Besides boasting the Golden Gate Bridge and a few other San Francisco Bay Area things, (cable car, etc. ), I recently read that San Francisco Bay Area Real Estate http://www.tricityhome.com has had something unique to the rest of the world and has for hundreds maybe thousands of years. San Francisco Bay Area Real Estate has nurtured an environment that produces Lactobacillus Sanfranciscensis, a world famous wild bacteria. Lactobacillus Sanfranciscensis is used to create San Francisco sourdough starter. It builds the foundation for dough in many baking recipes--most of all San Francisco sourdough bread. Actually, the bacteria has been shipped to bakeries all over the world for quite some time, so it is not unique entirely, but it is nice to know that it lives its naturally existing microbial life right here in my back yard, literally. I also read that "starter" (in this case using a wild yeast) can be used in many other forms of breads. Italian Panettone, German Stollen, Greek Christmas or Easter Bread and of course, Hot Cross Buns, of which this latter bread inspired this post and its image above. Naturally, these a fore mentioned national breads have their unique starters, but I happen to be biased a bit towards our very own San Francisco Bay Area Real Estate sourdough starter. Apparently, it does the same job as regular bread yeast with a twist— Lactobacillus Sanfranciscensis, while eating away at the flour, harbors a safe environment for other bacteria to grow together with it, giving it the one-of-a-kind label it deserves. Why mention it now? Once in a while I bake--sort of a downtime therapy that has its benefits. Spring has sprung, Easter is here and for my birthday I recently received, Peter Reinhart's Artisan Breads Every Day, a practical book that takes Reinhart's world-renowned expertise and politely inclines it to our kitchens here at home. Aside from the Baker's Percentage Formulas in the back of the book, it's very straight forward. Intrigued by some of the recipes, I knew I had to try the San Francisco sourdough "seed culture" and work my way to sourdough "starter" pages 38-43 (a bit involved). Carefully following the directions, I mixed the San Francisco sourdough ingredients in front of my open window, just to be sure the bacteria flew in the mix. Slowly but surely, over the time span of about a week and a half, it worked. I thought I would share the interesting fact that San Francisco sourdough yeast lives here in our San Francisco Bay Area. 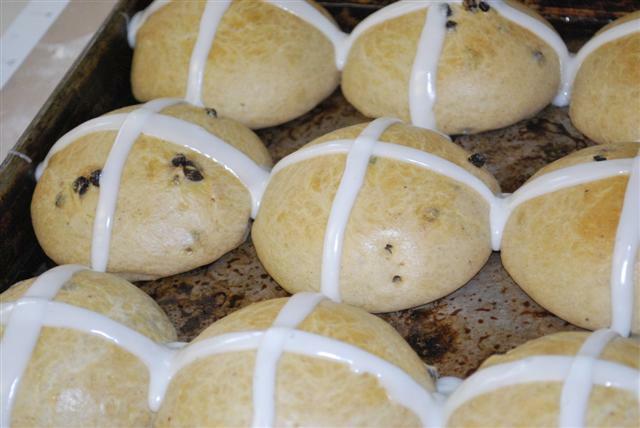 This Easter, my family will get to enjoy genuine Hot Cross Buns from scratch with white fondant glaze. Some day I may move from the San Francisco sourdough capital of the world, but even if and when I do, I will have to sneak some "culture" with me. The fact that I was born in San Francisco will always be a bit special to me, and taking a small piece of it with me wherever I end up will certainly be necessary, even if the piece of San Francisco is only microscopic at best.